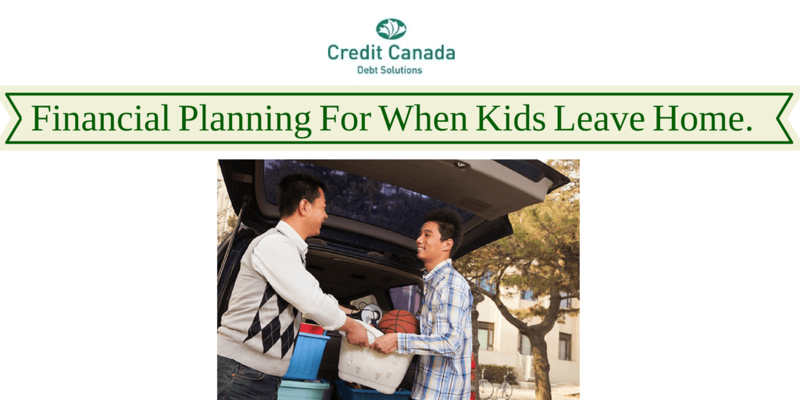 Financial Planning For When Kids Leave Home. Kids leaving home for the first time to attend college/university is a mixed-emotional soup for both parents and students---there is excitement, joy, a sense of pride as well as worry and anxiety. Lots going on. So perhaps, it’s also a good time for some astute financial planning and forward thinking that will ensure the experience remains a happy one for everyone. What’s needed? It seems to be open communication. In July 2014, an RBC poll highlighted the disconnect between parents and children in their answers regarding debt loads the kids carried, hidden spending, the undisclosed anxiety about taking on new debt and basically the fact that kids felt that they still had a lot to learn regarding their finances. Educate, empower, embolden…and release. Allow your kids to do as much as they can on their own. Allow them to make the calls, fill out the forms and dispute errors. This will instil a lifetime of confidence. Mistakes will happen---resist trying to fix them. Allow kids to learn from the small mishaps so that the big ones can be avoided later on. Check-in on a regular basis. If there are money issues, stay on it---there may be broader issues that need attention re finances, roommates/friends, assignments, etc. Expect a tiny bit of crazy money behaviour. Choose your battles wisely. Focus on the good and what’s working. People thrive on positive encouragement. Consider offering an incentive to ensure the money lasts past fall mid-terms. Something to encourage adherence to the plan. Stick to your budget as well and any agreement that you’ve made re school help. It’s important to remain flexible but you may also have to say no sometimes and that’s ok.
Be responsible with your financial planning. Set up a budget, track your expenses and be determined to make it work. Be honest if/when you make a financial mistake. A student loan is not a lottery win. Borrow as little as possible, manage it and make it last. If you make a money mistake, that’s ok. Don’t give up. Good budgeting takes time. Be thrifty with your cash and be happy about it. You’re building memories. These are the days that you’ll look back upon and wonder how you ever lived on so little. Stay away from any and all credit card offers at college and university. They want to catch you young and keep you hooked. Keep life simple---even if they’re offering you free stuff. Watch your cash/cards/cell/computer. People are watching. Remain steady in your spending/saving habits and do not allow others to sway you. Start summer job hunting EARLY. Apply for all of the free money that you can get---grants, bursaries, scholarships, etc. Don’t forget. Plan ahead. Study what you love. Doing what you love is the key to having a career that you love and maybe even a bank balance that will allow you to live the life that you want forever. Students: You will earn a grade-point average (GPA) in school---but as you move on, you will also earn/receive/take on other numbers: a credit score, a salary, an interest rate, a loan/mortgage, etc. School, money, life…somehow they are all connected, especially if you’re taking on student loans. So have fun, study hard, watch the cash, and enjoy the money talks---and all those future numbers will hopefully look good for you as well.